Dr. Ruben Arthur Calisto, 90, Logansport, Indiana, peacefully passed away at home on Monday, January 21, 2019, surrounded by his loving family. Dr. Calisto was born on January 18, 1929 in Quito, Ecuador, South America, to Alejandro and Carmelita del Carmen Ruiz- Calisto. Dr. Calisto graduated from the University of Quito and finished his medical school training there, coming to the United States in 1959. While completing his medical Residency in Colorado Springs, he met Karen Shumski, and they were married in 1961. Dr. Calisto started practice in emergency medicine in Minneapolis, Minnesota and moved to Logansport in 1968, where he practiced in family medicine at the Howard Clinic. For several years Dr. Calisto worked in general practice in Warsaw, Indiana before forming his private practice in 1973 in Logansport, until his retirement in 2001.
diagnosis, but he remained dedicated to patient care, visiting his patients in nursing homes and making house calls. One interesting fact is that when patients couldn’t pay their medical bills, they would “pay” him by giving him eggs and homemade baked goods. In his youth, Dr. Calisto was an avid soccer and tennis player and a champion cyclist. He grew up watching his grandmother play chess and became a master of the game, earning national ranking. He was a dedicated member of the Cass County Chess Club for over 40 years and won the Logansport City Championship in 1974.
proud to call the USA his home. He was a true Jeopardy champion without realizing it, as he was able to recite historical facts, geographical information and wartime history without hesitation. Some of his passions included listening to opera and classical music and watching old-time movies. Dr. Calisto was steadfast in his Catholic faith and was a proud supporter of All Saints Catholic Church and school. He donated time and treasure in giving free physical exams for several years to all student athletes who needed them. As proud as he was of his many achievements, Dr. Calisto’s greatest joy in life was his family. He is survived by his loving wife of 58 years, Karen; brother, Hernan, sister Grace Quito, Ecuador; brother Ivan, sister Nancy in Miami. 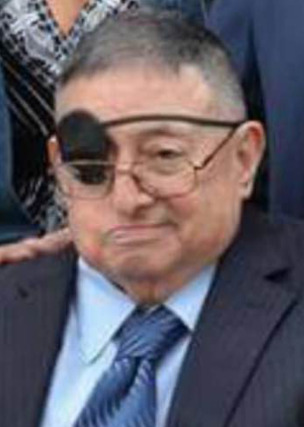 Ruben is also survived by his nine devoted children, Fabian (Kathy), Leticia, David (Natalie), Andy (Jodi), Suzanne Bennett (Bruce), Cynthia Hallam (Chris), Christopher (Catherine), Ray (Michelle), and Stefan (Tiffany); 25 grand-children and 7 great-grandchildren and several nieces and nephews in the United States and abroad. Family gatherings to celebrate holidays, birthdays, weddings and Minnesota Vikings Sundays were just a few of his favorite things. There were always beer-basted ribs, delicious sides and desserts and plentiful libations. He always loved a good imported cerveza! In accordance with Dr. Calisto’s wishes, the funeral service and burial will be private. Arrangements have been entrusted to Kroeger Funeral Home. In lieu of flowers, donations may be made to All Saints Catholic Church, 112 East Market St, Logansport 46947 or Guardian Angel Hospice, 513 W. Lincoln Road, Kokomo 46902, which took such excellent care of Dr. Calisto in his final weeks.